I first started logging my canoeing and kayaking trips in January 1979, when I was starting to work towards a number of British Canoe Union Awards. 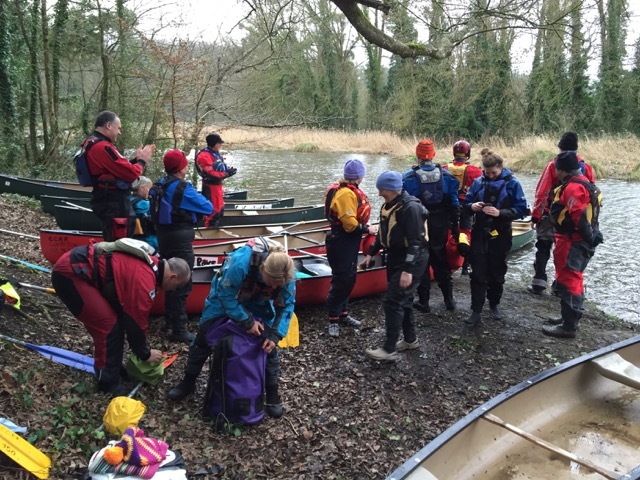 Sea Proficiency followed by Inland and Canoe Proficiency before moving onto Senior Instructor and Advanced Sea. A logbook was a pre-requisite for most assessments, as is some form of documentary evidence today. I found that once I started documenting my paddling experiences it became more and more difficult to stop. It has eventually developed into a series of notebooks documenting my paddling adventures of the last 38 years. It is a record of not just my paddling but includes details of where we parked the car when visiting new areas, any unusual weather, birds and animals seen etc. One thing that I have recorded is the distance covered and have watched it gradually increase over the years. The initial thought was “had I paddled around the distance of going round the earth at the equator”? According to Google the circumference of the earth at the equator is approximately 21,640 nautical miles. A pleasant morning was spent, several years ago, sorting through my logbooks and compiling an annual total. I discovered that I had passed the circumnavigation distance a couple of years earlier but have carried on keeping a record of my paddling journeys. Kayaking around Stromboli was a memorable paddle, not only from the scenery but because I also went past 26,000 nautical miles in my logbook. The location was in the channel between the main island and the small stack of Strombolicchio to the north east. After watching the GPS tick over to record the distance we paused for a few moments reflected on 26,000 nautical miles and carried on paddling to our landing, close to the harbour. We had a volcano to walk up! It was along this stretch of the Stromboli coastline that I passed 26,000 nautical miles. Taken from our walk up the volcano. The forecast for the weekend was pretty dreadful, we were questioning whether the ferry would be able to sail for St Malo, and even more importantly would we be able to get home on the Sunday. As it was the ferry did sail on the Friday and the sea state was calm enough that most people were able to enjoy a beer or wine on the crossing. 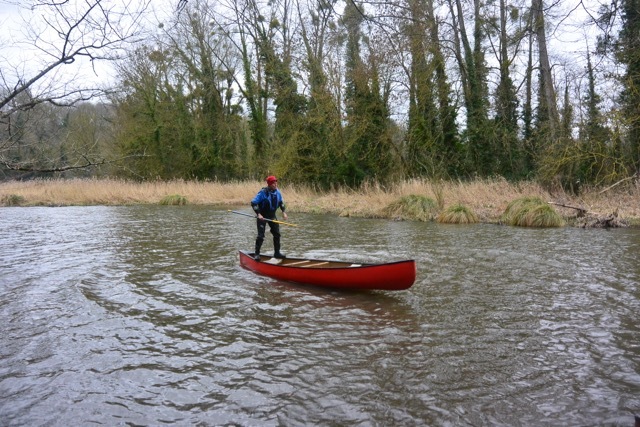 The aim for the weekend was to enjoy a couple of days of canoeing on the inland waterways of Northern Brittany, with a few people having the opportunity to take their 2 Star, mainly as a pre-requisite for their Level 1 coach course in May. Amazingly two of the people had their 5 Star (Sea) but not their 2 Star. In Jersey there is no inland water, suitable for paddling, so it is very difficult to get the appropriate experience, you either have to travel off island or we have to start encouraging people to paddle canoes on the sea, something which sits uneasily with me, due to the size of the tides, exposure to swell and changeable weather. We had arranged to rent canoes from the Canoe Club in Dinan, there were 16 of us and luckily they had 8 canoes in their spacious facilities. We headed downstream, fully aware that the forecast on French TV was for winds possibly reaching 100 kmh during the afternoon. Clearly we needed to exercise a degree of caution. Shelter was found inside a small inlet where it was possible to work on a few skills and also by coincidence to receive a phone call from the ferry company informing us that the sailing on Sunday had been brought forward to hopefully avoid the rapidly deteriorating weather conditions, particularly the increasing wind strength. We would get home but it meant that there would be no paddling on Sunday. Lunch was taken further downstream before we had to fight our way back to Dinan. 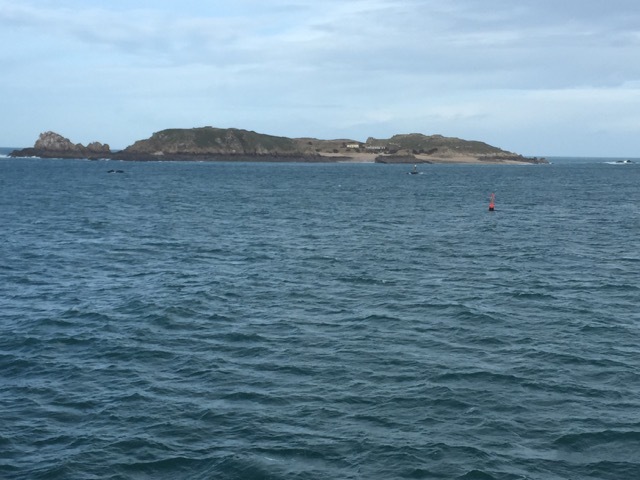 It was a pleasant contrast to the sea kayaking that we normally experience in Jersey and most of the group felt that we shouldn’t leave it too long before returning to France to hone our single blade paddling skills. 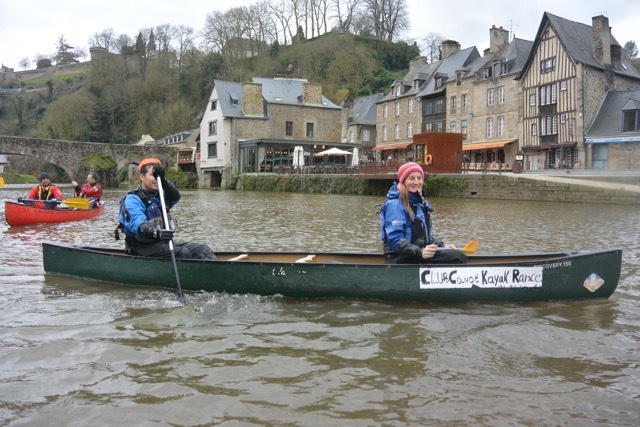 Louis and Lisa getting ready to head downstream from Dinan. At this point the wind wasn’t too bad. We found shelter in a small inlet where we were able to practice a few skills such as rescues, as well as receive a phone call from Condor (the ferry company) that our ferry was leaving earlier on the Sunday due to the strong winds which were forecast. The main consequence, apart from getting home, was that there would be no paddling on the Sunday. Tracey having a go at gunwhale bobbing. Clearly the days that she spent canoeing down the Yukon has had a significant impact on her skill level. She looked really competent. 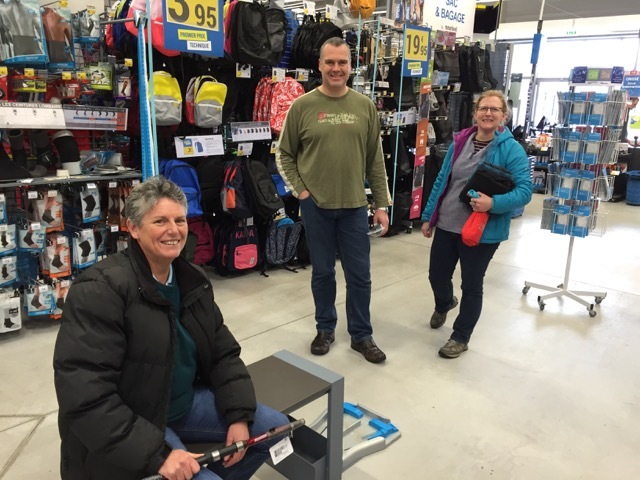 Once off the water there were a couple of choices, head to the local bar to watch a Six Nations rugby game on the television or head to Decathlon in search of kit. 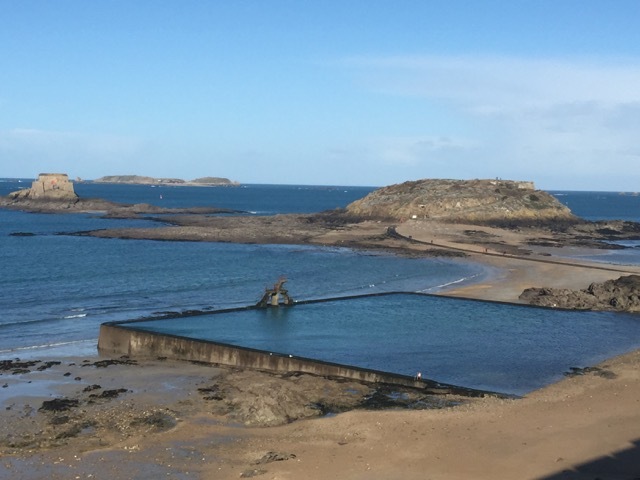 Sunday dawned sunny and still, a walk around the walls of St Malo was the option in the time that we had with the forecast of a rapidly increasing wind. Once on the ferry we headed out past Cezembre, a small island off the coast of St Malo, which is an interesting place to visit by kayak. 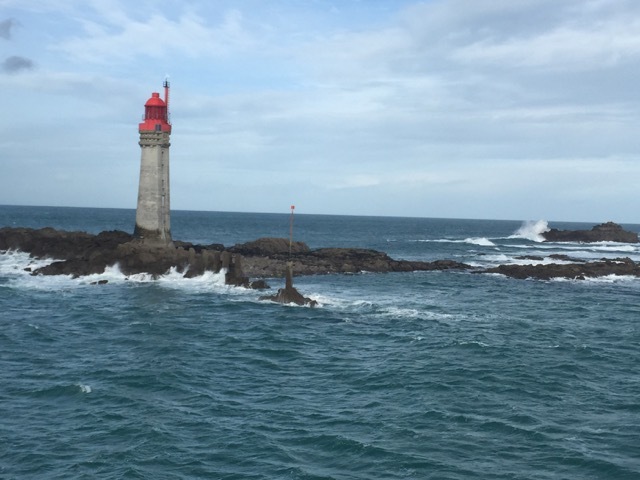 Le Grand Jardin light marks the entrance channel into St Malo, for us as we headed out to sea it marked the start of a decline in the weather, with an increasing wind and a deteriorating sea state, but at least due to our early departure we made it home. There is something quite special about paddling through the heart of one of the world’s great cities. Over the years I have been drawn to urban areas, as diverse as, Paris, New York, Seattle, Vanvouver and Venice to dip my blades into the water and without exception have never been disappointed. 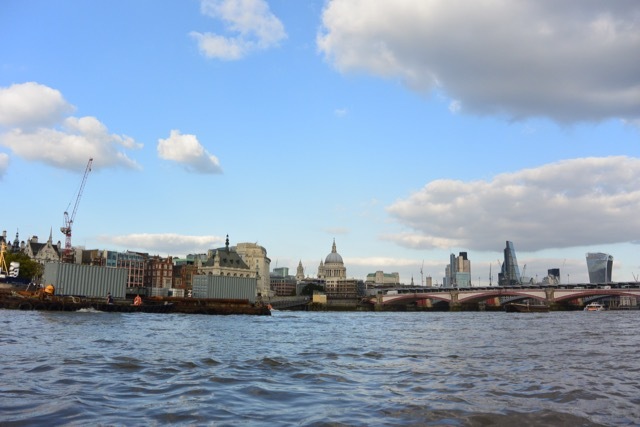 London is the city, which over the years I have paddled through most regularly. 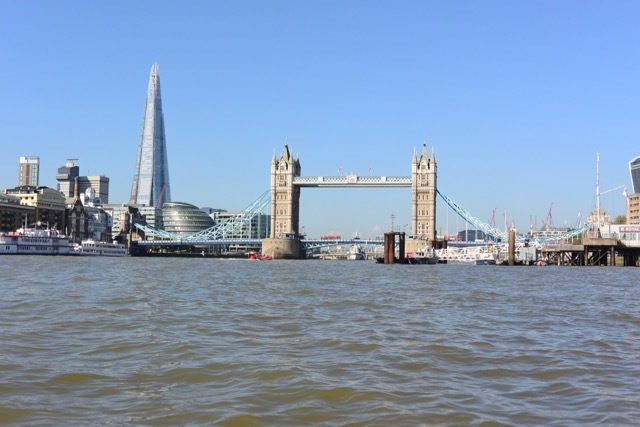 Each year I have returned to London, to enjoy a weekend on the water with other members of the Jersey Canoe Club, in the company of Tower Hamlets Canoe Club. The last weekend proved to be particularly enjoyable with perfect weather and tidal conditions, which allowed a number of options. 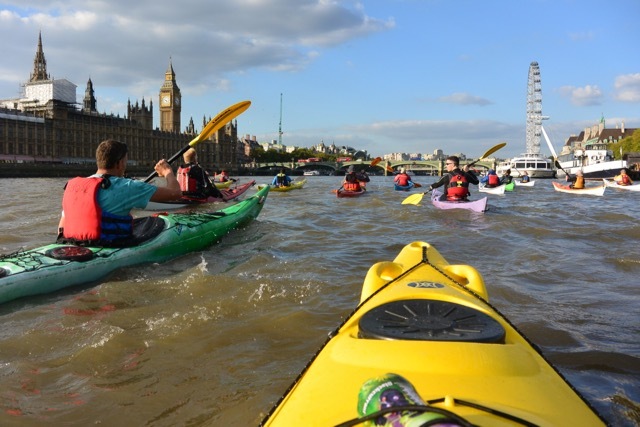 On the Saturday we paddled through the heart of London, from Shadwell Basin to Putney, where we took advantage of a riverside pub to top up our energy levels before heading back to the east end on the ebbing tide. Approaching Tower Bridge from the east. 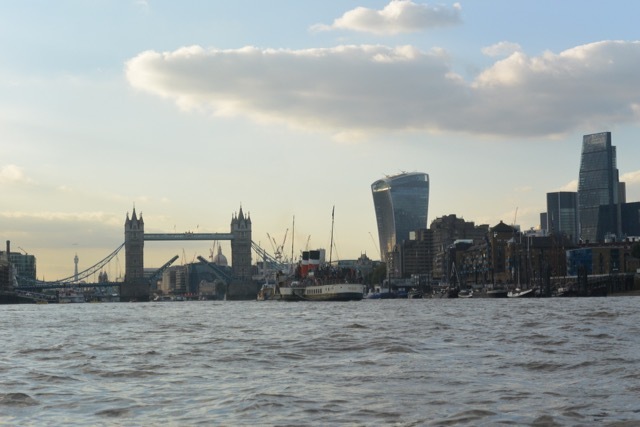 It is interesting to see how the skyline has changed in the 5 years that we have been visiting London for a weekends paddling. 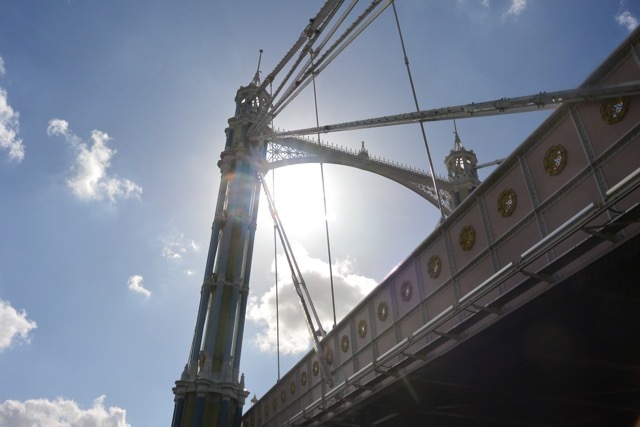 Underneath Albert Bridge. Most people have their favourite bridge, with Tower Bridge most people’s choice but the Albert Bridge is a very respectable runner up. The main reason for stopping at Vauxhall is to buy some egg custards from the Portuguese restaurant across the road but today we were in the company of 4 statues. 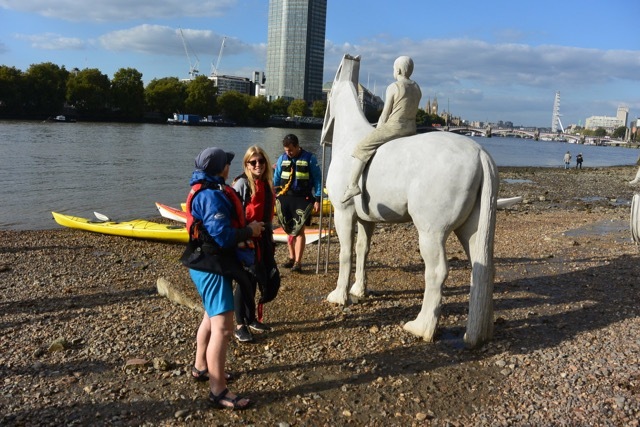 The Rising Tide, by British sculptor Jason deCaires Taylor, are 4 horses which become visible as the tide drops. Their heads have been replaced by oil well pumps, which is apparently a statement on our reliance on fossil fuels. The are part of the Totally Thames Festival which finishes tomorrow, 30th September. With a view like this, it has to be one of the finest day trips that it is possible to do in a sea kayak. 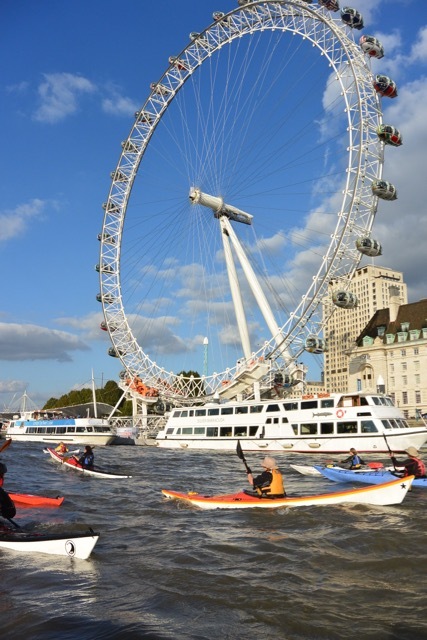 If you haven’t paddled through the centre of London, you should start planning a visit soon. The London Eye always looks spectacular when seen from the river. 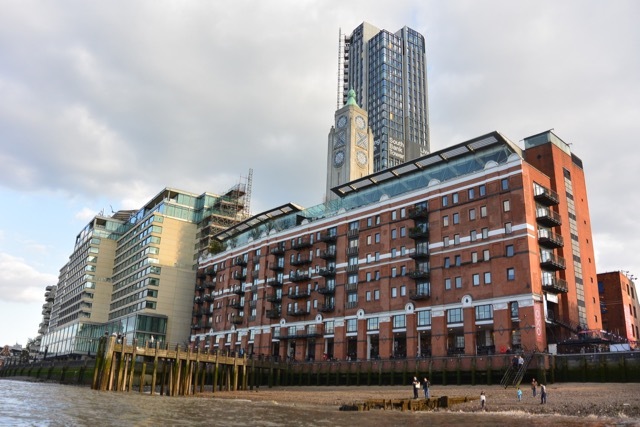 The OXO building was a river landmark from the 1930’s until it fell into disuse in the 1970’s. Refurbished in the 1990’s it is now a vibrant area of the south bank of the Thames with shops, design studios and a delightful restaurant where we once had a memorable meal overlooking the Thames as the sun set over London. The old and new of the London skyline. 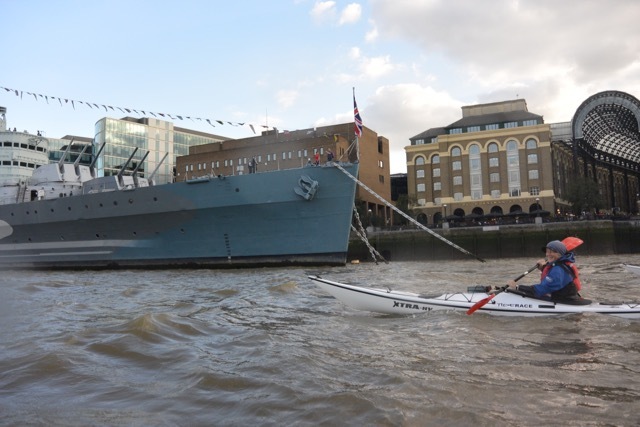 Nicky passing the bow of HMS Belfast. 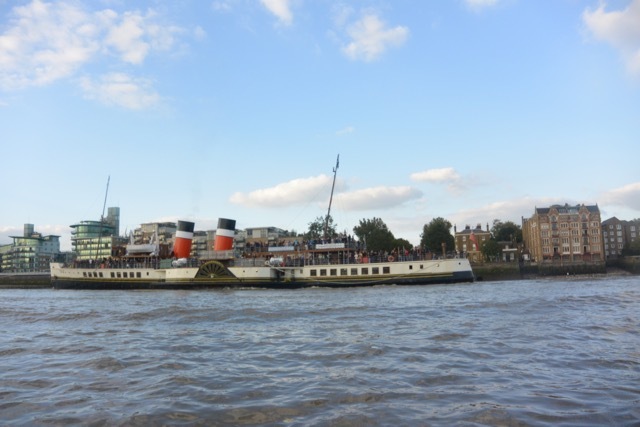 It was a real surprise to see the PS Waverley, which is the worlds last sea going paddle steamer. Built in 1946 she spent her working life on the Clyde, in Scotland before retiring in 1973. Restored to her 1947 appearance she now operates passenger excursions around the British coast. This was a real surprise to see Tower Bridge opening, to allow the Waverley through. Although the bridge opens about 850 times a year, to allow ships with a mast height greater than 30 feet to access the Upper Pool of London, I think that this was the first time I had actually seen it open. These are the last of the old photographs that I have been able to scan in for a while. Some good memories of paddling in Jersey and further afield. Derek Hairon on the Roche du Diable in southern Brittany, Easter 1983. This was a time when canoes were not seen that frequently on white water in Europe. Playing at Le Mourier Valley. We used to build little dams to hold back the water and then release it so that it was possible to shoot down the concrete steps. It was best to do it whilst it was still raining. It has been quite a few years since we did this last, should be time for a return visit. Self rescues off Greve de Lecq. This was experimenting on a Senior Instructor Training course in about 1982. Nicky off the southern tip of the Quiberon Peninsula in 1984. We were crossing to Houat, a delightful island, for lunch. Arriving in Carteret on the Normandy coast. The 14th July 1989, we had gone over for the 200th anniversary of the storming of the Bastille. On the Rance in France, in the early 1990’s. It was one of those days when kayaking on the sea would have involved paddling from one sheltered location to the next, but in Brittany there are plenty of sheltered estuaries to head to. Canoeing in the forests of northern Maine. Great family holidays in the early 1990’s. The girls may have enjoyed this part of the holiday more. On the statue of Andre the seal in Rockport. Andre just a great children’s book and film. The tape version was played for hours on car journeys.